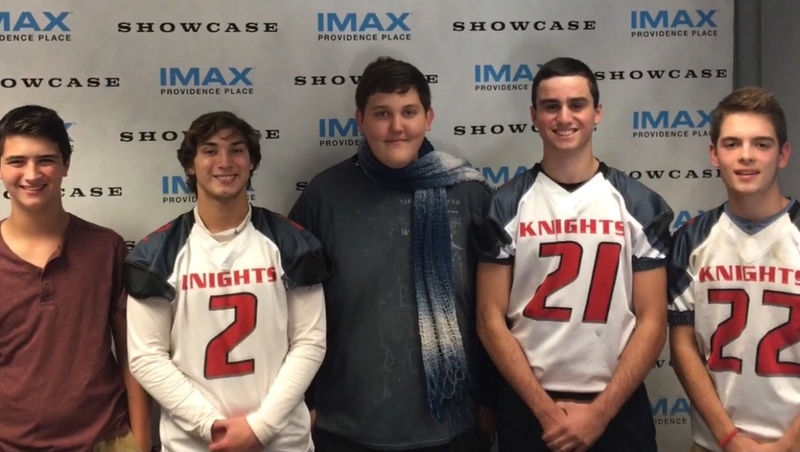 Congratulations to this week’s Showcase Cinemas High School Team of the Week: Exeter West Greenwich Football! I think the Exeter West Greenwich Football team should be considered as Showcases team of the week because we may not be as big as other schools but we have a ton of dedicated players and lots of team spirit! The team’s moms have to be our cheerleaders because we do not have any. They make posters, banners, teeshirts and support us every single week we play! We won our first 3 games and these are the same teams that beat us last season by 20 or more points! Our team may not be a big team but we are strong in brotherhood. I don’t have any siblings and when I joined this team, I now know I have 32 brothers for life! We have pasta dinners every Friday night and we play sports, eat and talk instead of going to parties and getting in trouble. We are going to have a breast cancer awareness game this month and have our fans “pass the pink” (PTP) which is a large decorated empty 5 gallon water jug and we will donate all the money to the Gloria Gemma Breast Cancer Foundation. I really hope you will consider us for this honor—-It will mean a lot to our team, our parents and our community.